SYNOPSIS: Nineteen years ago, the Aquatica project used genetically altered sharks in hopes of developing a cutting-edge cure for Alzheimer's disease. They came close to achieving their goal but an unforeseen tragedy derailed the experiment. Now pharmaceutical billionaire Carl Durant is determined to revive the research of the undersea laboratory. With former Navy seal Trent Slater and scientists Daniel and Leslie Kim already on board, Durant hopes to enlist shark conservationist Misty Calhoun onto the team. But Calhoun is shocked to learn that the company is using unpredictable and highly aggressive bull sharks, the most lethal predators in the sea as its test subjects. Before long, this drug-enhanced sharks led by den mother Bella are growing smarter, quicker and much, much deadlier. In 1999, Renny Harlin (Die Hard 2, The Long Kiss Good Night) made a trashy shark thriller named Deep Blue Sea which did moderate business but is noted for being selected as one of the greatest shark movies of all time and most of all, the surprise death of one of it’s major cast member. For whatever reason, Warner decides to produce a direct-to-video sequel that proved there is always worthless entertainment floating around. 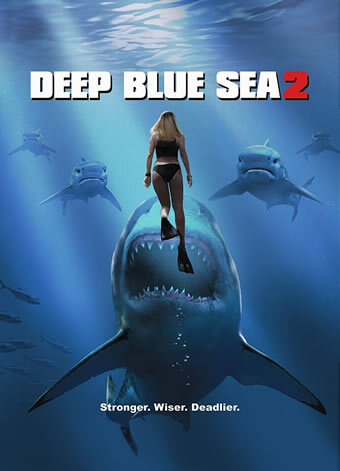 Deep Blue Sea 2 involves an eccentric billionaire, Carl Durant (Michael Beach) who has invited a shark conservationist, Misty (Danielle Savre) and newly-weds neurobiologists Leslie and Daniel to his undersea facility for a visit. Unknown to them, Carl is genetically altering the brains of five bull sharks including the alpha shark, Bella and the reason is for the guests to examine why they are behaving strangely liked digging their way out of the underwater fences. Of course, Deep Blue Sea 2 wastes no time in killing off all those trapped in the undersea facility once Bella and her gang decides to sabotage the place. We don’t see the logic of why Durant chose to breed these potentially vicious bull sharks for medical tests or why he is drinking those genetics-altering liquid except we are told he is paranoid over technology taking over humans. On the other hand, we are quite sure you are not here to listen to Durant’s ranting. Director Darin Scott manages to pull off a couple of gruesome deaths despite the obvious ultra-low budget and you can’t really blame him for paying tribute to the original, do you? However, that is about the one and only good thing about this flick as it functions neither as an exciting action thriller or a mindless trashy monster movie. For more than half of the movie, you don’t even see the sharks just a few quick scenes featuring lame CGI shark pups that behaved liked piranhas. The mostly unknown cast put on their best performances as supper for the sharks. Leading man Rob Mayes’ Trent Slater is a stand-in for the original Thomas Jane’s role. Danielle Savre as an added bonus chipped in an unnecessary shot of her cleavage and where is LL Cool J when you need him. Deep Blue Sea 2 is so bad that you wished Warner should just release The Meg much earlier to compensate for our time. Returning to the Deep: Making Deep Blue Sea 2 is a 12 minutes feature that offers a look behind the stunts plus the obligatory cast and crew interviews. Deep Blue Sea 2: Death by Shark features a closer look at the demise of the characters. Gag Reel is just 3 minutes of the cast horsing around on set. There are 4 Deleted Scenes mostly on the characters of Misty and Trent. The Dolby Digital 5.1 supplied on the DVD is serviceable enough for a handful of bombastic sequences and the visual on the whole is acceptable for a movie of this budget as a bluray or 4K version of it will betrayed the dull visuals, colours and the often sparse-looking sets.